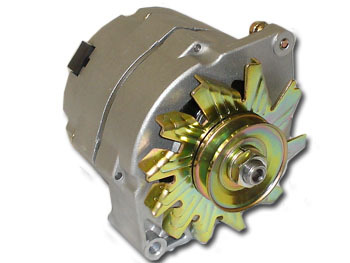 This is a great replacement alternator for upgrading from a 6 Volt Positive Ground system without changing the whole vehicles wiring. It can also be used as a high output upgrade on vehicles with a factory 12 Volt positive ground generator. It is a 1-wire alternator, so there is only an output cable required for installation. They can also be used to control a dash light by using our W290 wiring harness. Also see our Brackets section for a quick easy conversion bracket to replace OE generators. These units are supplied with a pulley. Make sure to measure the width of the belt across the top that you will be using and select the correct pulley to match your belt.